HARLEM — When 10-year-old Deeyonna Cooper reads books at home, it's a family affair. 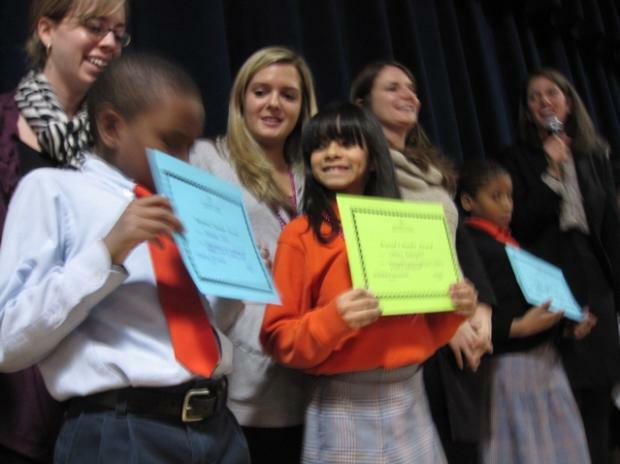 The fifth grader at Harlem Success Academy often reads to her mom and she also likes to read to her dog. "When I read to my dog, he just twists his head in confusion," Cooper said with a giggle. Given what a prolific reader Cooper is, she just might have one of the most confused dogs in the city. Since 2006, she, along with 2,400 other students at the Harlem and South Bronx schools of the Success Charter Network, have read one million books outside of school hours. Kids at the Harlem charter school celebrated the accomplishment today with a giant banner congratulating them on the literary feat. "Books are a religion to us," said former City Councilwoman Eva Moskowitz, founder of the Success Charter Network. There have been a few rules along the way to reaching this goal. Kids were allowed to pick their own books and each school signs a symbolic contract with parents to ensure that they will read to their children six days per week. "God gives a day of rest and so do we," Moskowitz joked. Parents who don't speak English are given books on tape to listen to with their children. In addition to reading six books per week on their own, the children read up to 12 books per week in school. The goal is develop a passion for reading and writing, said Moskowitz. "Our goal is college graduation," she said. "We want our kids to feel that going to college and graduating is as natural as breathing." That's why Moskowitz said she didn't understand the opposition at efforts to expand the network of charter schools. The Panel for Educational Policy recently approved the network's expansion to the Upper West Side at Brandeis High School. In Harlem, the school will expand at the current location it shares with Sojourner Truth School. Eventually, the school would add seventh and eighth grades and expand into a new building on West 114th Street that is currently occupied by Wadleigh Secondary School for Performing Arts and Frederick Douglass Academy II. "I don't think people understand the holistic vision we have for our children," Moskowitz said. Parents have complained that there is not enough space and that kids at those schools will be shortchanged, a charge Success Charter Network denies. Faith Rodriguez, 10, a fifth grader at Harlem Success Academy, said she has loved participating in the challenge and has no plans to stop reading. "Reading teaches you important lessons, like how to be yourself," she said. "We thought we wouldn't reach a million books but we made it."